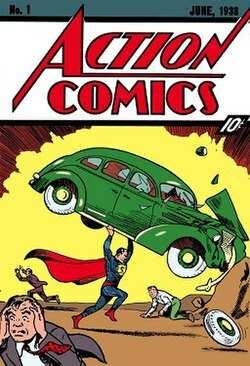 75 years ago today (18/04/1937) Action Comics issue one hit the stands in America, containing Superman’s first appearance. With it Action Comics #1 brought a new genre of comic book. The super-heroes. Without Superman there would have been no Batman, which was released because Superman sold so well. There would be no need for Jack Kirby and Joe Simon to create Captain America, creating Timely Comics, DC’s main competitor. There would have been no pressure on Stan Lee to make sure that Timely Comics outsold DC (Which led to it’s name change to Marvel) There would be no multi-billion dollar movie franchises based on these now widely popular characters. The actual inclusion of Superman was an accident. The publisher, Jack Liebowitz, wanted something to stand out on the cover of his new comic. Detective Comics, which would later serve as the home of Batman, had been in print for almost a year and sold reasonably well, but Liebowitz needed something new and exciting. It was due to time constraints that he bought a story by Joe Shuster and Jerry Siegel. They were payed $10 a page, resulting in $130 each for their 13 page story, simply title ‘Superman’. Not only did this accident launch one of the most popular American icons of the 20th century, it also launched the super-hero comic, which would become the most dominating genre of comic up to this day. It’s easy to see why this comic is widely considered one of the most significant comic ever. It sold out it’s initial printing of 200,000 and Action Comics soon started selling 1 million + copies a month, leading to Superman’s own spin-of title and the creation of Batman, Wonder Woman and the Green Lantern to help create the super-hero genre. Today Action Comics #1 is the single most valuable issue of all time. It’s recently sold for over $2 million in auction. Very few copies are known to still exist and even fewer are in good condition. Without it my childhood wouldn’t have included these heroes that have inspired and entertained generation after generation. In celebration of the 75th anniversary of Action Comics #1 Comic Book Resources counted down the 75 best Superman stories ever written. Surprisingly Alan Moore took the top 2 spots with “For The Man Who Has Everything” and “Whatever Happened to the Man of Tomorrow.” While I’m shocked that they are considered the best Superman stories ever written it is nice to see that Alan Moore’s stories beat Grant Morrison’s All-Star Superman among overs. Comics have inspired me in my writing more than any other form. It’s visual, constantly changing and expanding and not afraid to enter new grounds which others wouldn’t approach. Without Superman it’s unclear whether the medium would have survived to this day, but it definitely wouldn’t have been as significant. This entry was posted in Uncategorized and tagged 20th Century, Action Comics, Books, Comics, Inspirational, Reading, Superman, Writing. Bookmark the permalink.